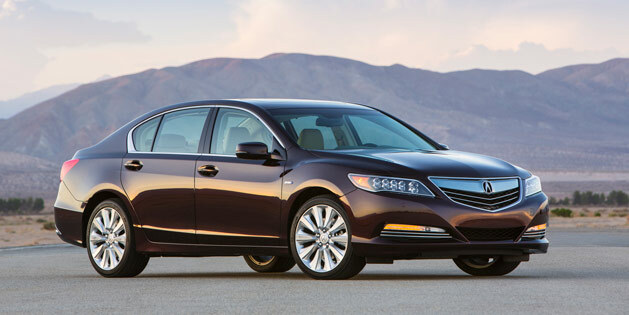 Acura’s pioneering Sport Hybrid Super-Handling All-Wheel Drive (Sport Hybrid SH-AWD) system has been chosen as a finalist for Green Car Journal’s2014 Green Car Technology Award, which will be awarded January 22, 2014 at the Washington Auto Show in Washington, D.C. The award considers technologies that enable significantly improved environmental performance. The 2014 Acura RLX Sport Hybrid, launching in spring of 2014, is the first Acura vehicle to utilize this groundbreaking new technology that delivers exhilarating performance with class-leading fuel economy ratings via its three-motor hybrid system with unique electric motor-powered torque-vectoring capability. The RLX Sport Hybrid SH-AWD system uses a total of three electric motors. In front, there is a single 35-kilowatt (47 horsepower) motor-generator integrated with the 7-speed Dual Clutch Transmission that boosts engine performance and helps recharge the vehicle’s lithium-ion battery pack via regenerative braking and engine-powered electricity generation. In the rear, there is a Twin Motor Unit (TMU) containing two 27-kilowatt (36 horsepower) electric motors that dynamically distribute electric-motor torque to the rear wheels, providing both positive and negative (regenerative braking) torque to aid performance and handling. The RLX also makes extensive use of advanced materials, including aluminum and high-strength steel, to minimize vehicle weight while increasing body stiffness and rigidity. High-strength steels comprise 55 percent of the body with ultra-high strength steel used in key areas for enhanced collision performance, as illustrated in narrow frontal offset and side impact crash safety and roof strength tests. Use of aluminum in key areas saves 76.1 pounds compared to traditional all-steel construction, providing high strength with light weight that directly benefits ride, handling, fuel efficiency, emissions and safety performance. The award-winning Green Car Journal has focused on the intersection of automobiles, energy and environment since its launch in 1992. As a part of its mission, the magazine hosts events, produces ride-and-drives of advanced and clean fuel vehicles, and conducts various outreach efforts to educate consumers on better and more positive vehicle choices.